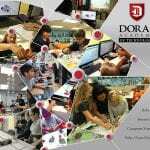 Doral Academy of Technology (Doral, FL). The seventh grade civics curriculum develops a student’s understanding of the foundations of our constitutional democracy and the fundamental principles and values upon which they were founded. Students participate in a Civic Political Fair, taking surveys to determine political scale awareness. DAT offers elective courses in law studies. Students learn how the American justice system works from a civil and criminal perspective that includes mock trials and speech and debate. Middle school students can serve as jurors, critique student attorneys for a mock trial, and shadow high school students while they prepare for a district-wide Mock Trial Competition. In the competition, DAT students present four full trials, opening statements, and closing arguments. They prepare witnesses, authenticate documents, and engage in direct and cross-examinations. Additionally, this past election season middle school students participated in a mock election where they voted on the Florida ballot.